Dr. Mancuso has spent numerous days educating middle school students about the importance of oral health, and it’s role in promoting good overall health. She most recently visited the children at the Garfield Middle School where the students learned how to properly brush and care for their teeth at home. 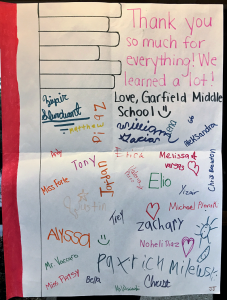 The children presented this poster to Dr. Mancuso, thanking her for her visit.